Clear Genius® is a newly designed, water pitcher filter system with a reusable cartridge that takes the place of the current water pitcher replacement filter options. 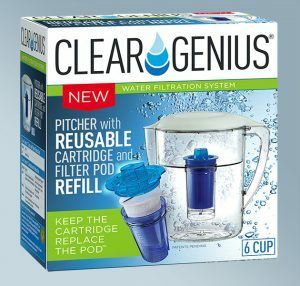 Clear Genius®, utilizing a patent pending two-piece reusable cartridge with replaceable Filter Pod® refills, fits directly into your existing Brita®* Clear Genius® or PUR®* water pitcher . This innovative product provides a more environmentally conscious and cost effective avenue to filter water at home. This Giveaway has now ended. Keep an eye out for the next giveaway! Enter to Win Your Clear Genius and Amazon Gift! Week 3: Clear Genius® Water Pitcher with Reusable Cartridge and Filter Pod® and $50 Amazon gift card. Week 4: Clear Genius® Water Pitcher with Reusable Cartridge and Filter Pod® and $100 Amazon gift card. Official rules: No purchase necessary. Must be 18 years or older and a resident of the USA to be eligible to win. Contest begins Monday, June 2, 2017 at 12am PST and ends Friday, June 30, 2017 at 12 PM PST. Winners will be selected at random. One winner per week will be selected and notified within 48 hours of selection. If winner does not claim prize within 48 hours from notification a new winner will be selected. Total prizes are valued at over $240.00. By giving us your email address you are opting in to receiving news alerts and special offers from Clear Genius® via email. Amazon Corporation is in no way affiliated with this giveaway. Entering this contest more than one time does not increase your chances of winning.